ST. PAUL, Minnesota (PAI and Workday Minnesota) — Politics, policy and planning for the 2015 state legislature took center stage at the Minnesota AFL-CIO Convention in St. Paul, from Sept. 21-23 — but not until after the 500 delegates started by celebrating a big union organizing win: The 26,000 home health care workers whom the Service Employees will now represent. Those home health care workers and other union members spoke of the importance of having a voice on the job-both for themselves and the people they serve. Shaquonica Johnson, part of the 2-year campaign to change state law and win collective bargaining rights for her and other home health care workers, noted women of color like her fill most of those jobs. 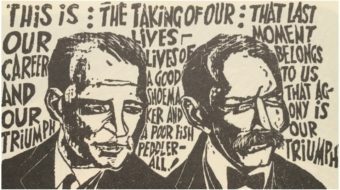 In nearly every organizing drive in the state, employers mounted aggressive anti-union efforts that included hiring expensive consultants and holding meetings with workers. Cody Jakowski, who provides residential and support services for adults with traumatic brain injury or mental illness at Stepping Stones for Living in Hermantown, said management was dismissive toward the workers’ concerns. “The expectation from administration is, you can do this for a wage of $9.50 an hour or you can work somewhere else,” he said. The home health care workers’ success was tied directly to politics, as Gov. Mark Dayton, DFL-Minn., and the Democratic-Farmer-Labor-run legislature pushed through pro-worker measures in the last two years, including giving the home health care workers the right to organize. But Minnesota’s workers face threatened attacks on their collective bargaining rights similar to those in Wisconsin and other states, if the Republicans triumph in this fall’s election, speakers warned. So delegates focused on re-electing Dayton, retaining the DFL legislative majorities and re-electing Sen. Al Franken, DFL-Minn., to a new 6-year term. Republican Jeff Johnson opposes Dayton this fall. The fed endorsed Dayton early in 2014. It’s mounting a major effort to turn out votes for him, legislative candidates and Franken. Dayton touted progress in many areas during his first term: More funding for early child-hood education, adopting all-day kindergarten, raising the minimum wage, marriage equality, holding the line on tuition increases, higher income taxes on the wealthy, statewide property tax relief, elimination of school debt and “an honestly balanced budget,” among others. Under Dayton’s leadership, lawmakers voted in 2014 to invest $1 billion in infrastructure projects, creating thousands of jobs for construction workers and others. If re-elected, Dayton promised to advocate for a comprehensive transportation plan to rebuild bridges and roads and beef up transit and other services. “With your help and support, we’ll keep moving ahead,” he said in thanking the state fed for its early endorsement. Transportation is one top priority for the labor movement going into the 2015 legislative session, and paid sick leave is another. State House Speaker Paul Thissen (DFL) added affordable childcare to the list. This year’s minimum wage victory “shows that we need each other and when we do stand together, we can get things done,” Brian Rusche, executive director of the Joint Religious Legislative Coalition, told the conclave, referring to the paid leave bill. More than 900,000 Minnesota workers, many of them in restaurant, health care and other jobs that directly serve the public, have no access to earned sick time. Many workers face the threat of being disciplined or fired if they take time off due to illness or to care for a family member. Paid sick leave legislation is likely to build on an unsuccessful 2014 proposal to allow employees to earn one hour of paid sick time for every 30 hours worked. Nearly half of Minnesota’s roads and bridges are more than 50 years old and transit services are inadequate, the fed said. It added the state’s population and job growth outpace the current infrastructure. “We believe any transportation solution has to be comprehensive…roads, highways, bridges, public transportation, biking and walking,” said Jennifer Munt, director of public affairs and public policy for AFSCME Council 5. Supported a $15 minimum wage for workers at the Minneapolis-St. Paul International Airport. Of the approximately 10,000 people employed there, more than 2,500 make substantially less than $15 an hour. Called for fewer standardized tests in schools, other ways to measure schools’ progress, and closing the opportunity gap between white and non-white students. They also called for more education on the history of workers and unions. “We need thinkers – not test takers,” said Emily Lynch, a member of Education Minnesota Local 7225 in Rochester. For more information on the convention click here. 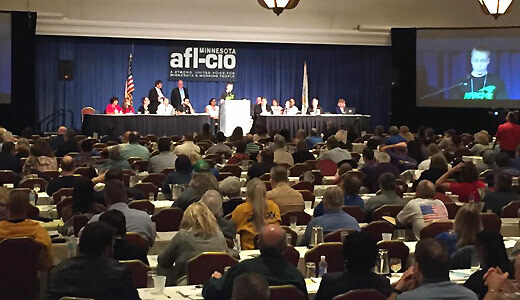 Photo: Convention delegates learning about organizing victories, MN AFL-CIO Facebook.